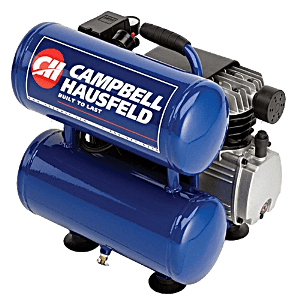 Campbell Hausfeld Air Compressor Reviews – The Best Brand in The Air Compressor Game? Campbell Hausfeld is a name to strike fear into the heart of any job requiring an air driven power tool. See those jobs quake at the knees when they learn about the wide range of compressed air pumps that are on offer from this well-known brand. It doesn’t make any difference whether you are a simple, blowing the leaves or inflating the tyres type of task, even up to a butcher driving a spray gun or spinning a grinder task, there is a suitable product to be had in the Campbell Hausfeld range. There are a number of compressors in the range so before you splash out your hard earned, you do need to understand the pros and cons of each model. Read up here about the features on offer for each model and how they can benefit you. 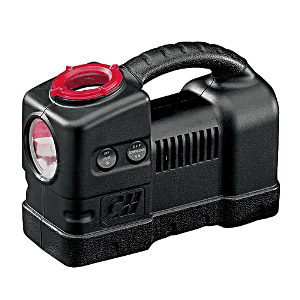 Using a high volume air pump, the RP3200 makes light work of pool accessory and bicycle and car tyre inflation tasks – a true 12volt air compressor﻿. If you get caught with an unexpected flat, this pump is small enough to fit neatly in the boot of your car without getting in the way. It’s just there when you need it. It can be powered from your car battery, again making it ideal if you get an unexpected flat. It sports a nifty auto shutoff feature so whatever you are inflating, there’s no need to be concerned about over inflation or bursting a more delicate ball or cycle tyre. Given the really excellent price that this machine is available for, you’ll soon be back in credit as you save all of the money you’d otherwise spend checking your tyres at the petrol station. 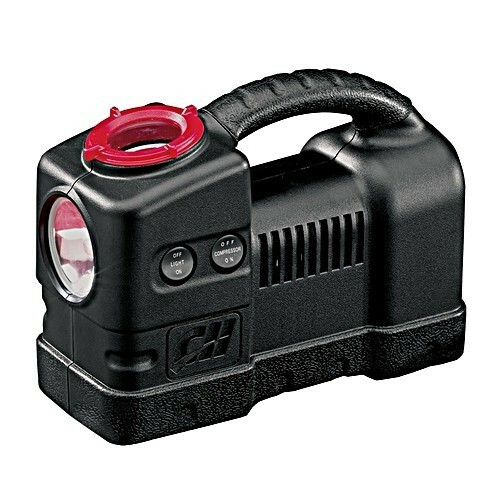 Combine that with great portability, this is one pump that’ll be there when you need it after a blowout. What’s not to like. 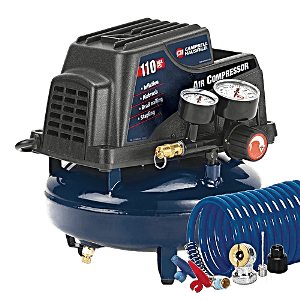 For DIY around the home or garage this really does need to be your go-to pancake type air compressor. The pancake design (so called because of the shape of the tank – obvious ain’t it) means that you can pack a lot of compressed air into a relatively small footprint so expect it to have all the oomph you need for those domestic jobs. Delivering 100 psi it is also meaty enough to support air tools on a construction site although you’d be disappointed if you were wanting to supply multiple tools, the tank’s just not big enough. Manufactured by Campbell Hausfeld you can expect mechanical excellence and it is designed to be easy to use. Compact and light weight means it is easy to port about as well as store away when not being used. On top of that, easily read gauges give a quick and accurate way of monitoring the pressure in the tank and in anything being inflated. 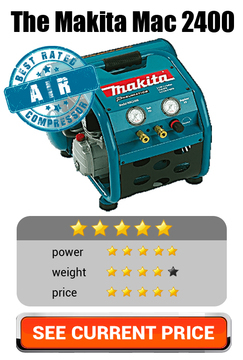 Best suited for: Even though it can be used on a construction site there’s no doubt this compressor is most at home, at home. It’s perfect for inflating sports balls, swimming pool accessories and car and cycle tyres. It’s also a useful tool for cleaning, either debris on work surfaces or perhaps autumn leaves around the garden. With a 25 foot recoil hose and its light weight, it is easy to move around the garden as well. Domestic it seems to be! 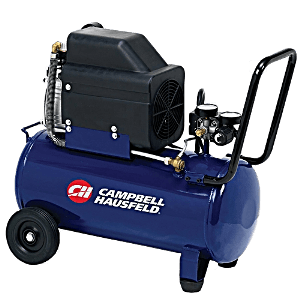 Oil less running means that the Campbell Hausfeld FP209499 3-Gallon Portable Compressor is easier to maintain than many competitor portable air compressors and with its 110 maximum PSI and the three gallon tank it is perfect for many about the house tasks. It will supply a number of tools such as staplers and nail guns perfectly adequately but it would struggle to keep up with continuously supplied air tools such as grinders and sandblasters. Thoughtfully, those nice people at Campbell Hausfeld have included a comprehensive accessory kit which includes 25-foot recoil hose making it easy to get to most locations. The kit contains a good selection of accessories that mean you can make the best out of the compressor in a variety of It. The pump also comes with a blow gun, female coupler, two inflation needles, two male plugs, an air chuck, an inflation adapter, and some PTFE tape to make sure your adapters seal well. 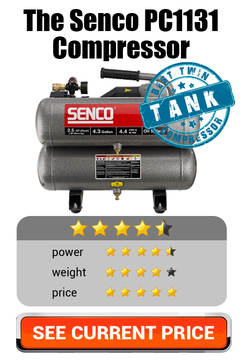 Best suited for: Looking for a portable air compressor for home use, or for light tasks such as nailing and stapling? This is one of the best (and most favoured) portable compressors on the market - and the fact that it comes ready with accessories means the value you get is unbeatable. Oil lubricated means smoother running which in turn means quieter operation with the Campbell Hausfeld HL5402. It is very compact in design as it has a twin stack configuration of one tank on top of another. The tanks are kept full by a 1.3 HP motor that provides a healthy 125 psi. Once the tank is filled to the required pressure the motor will cut out to avoid over pressurising and it will cut in automatically as the pressure reduces. Clear display gauges tell you exactly how much compressed air is available at any time and control is made even easy when using an air hose as there is a clever value that controls how much air is released. All things considered this is a compressor that is perfect for home and garden working that can also be used on site for smaller tools that get used intermittently. Brad nailers and impact wrenches are exactly the sort of commercial tools that this compressor is designed for. Best suited for: Despite the 4 gallon tank capacity, the twin tank configuration means that the Campbell Hausfeld HL5402 is a very compact footprint so it is perfect for use in confined spaces. The footprint also makes it useful at home where it can be easily stored when not in use. A small space in a cupboard or under the stairs is all that’s needed. Just as the brand suggests, the Campbell Hausfeld HL540100AV is a compressor you can rely on. The wheelbarrow design – wheels attached to the tank and a clever carrying handle - means that even this weighty machine is mobile and can easily be moved around. Simple dependable design combines a larger 8 gallon tank with an oil lubricated pump to give a compressor that is quiet but can still handle almost every activity you’d ask of it at home. Powerful enough to drive a ½ inch wrench, you’ll also be able to undertake most other tasks with the exception of paint spraying. Clear instructions for maintaining the oil lubricated pump will give you year of trouble free compressor operation of you follow them. The motor is hidden by a clever plastic cover. This means that you get to avoid burning yourself on the cast iron cylinder when it is running. Best suited for: If you are looking for a brand you can trust, especially for home use then this is a compressor not to be sneezed at. It is a perfect machine for a demanding do-it-yourselfer and despite its compact size it is powerful for most of home uses. It can also be used with a wide range of air tools so can be used effectively in the workshop or on a construction site for lighter activities such as nailing. 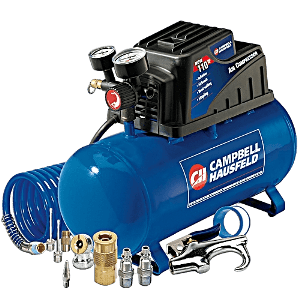 And there you have it – the 5 most popular Campbell Hausfeld Air Compressor Reviews, so now if you’re considering an air compressor for this company you’ll be sure to choose a good one.